It is a universal robot that can be adapted for any purpose. 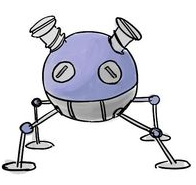 Botbot, the Socket tuxemon, is a Metal-type monster. When Botbot is equipped with Booster Tech, it evolves into the evolution of your choice. When it stops holding the Booster Tech for whatever reason, it devolves to Botbot again.